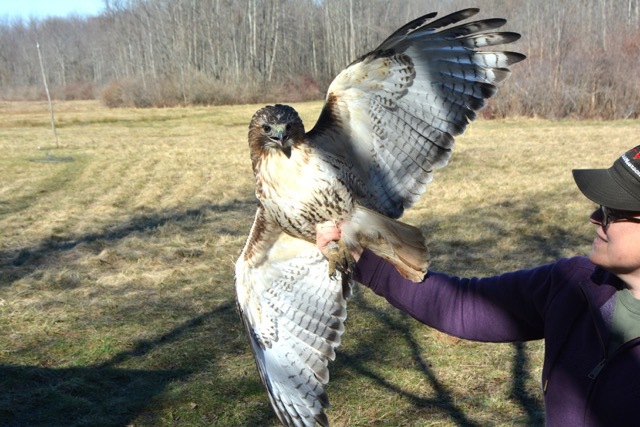 Raptor Banding Update – Careful What You Wish For! 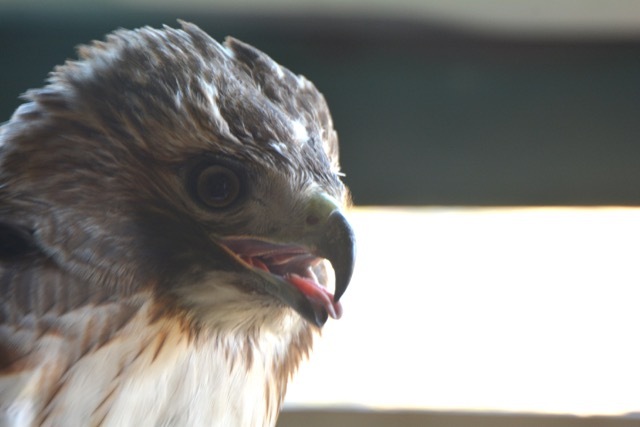 We love south and southwest winds for hawks. Nothing is better for bringing them right along the lakeshore and right over the banding station, but be careful what you wish for! The only decent day for banding this week turned out to be Thursday (March 17th, St. Patrick’s Day), so Susie Cotsworth and I headed out for the banding station around 10 AM with high hopes. As it turned out, a couple of matters delayed my getting there by about fifteen minutes, so when I arrived at the station it was to a “Thank God! Here, take this hawk!” as Susie handed me a can-ful of very feisty, large Red-tailed Hawk she had captured right upon opening. We had three rapt visitors watching the spectacle. Susie gave me the hawk for processing so she could turn her attention back to the trapping process. Unfortunately the hawk, a rather large one, was of an awkward neither-nor size – too big for our usual red-tail can, too small for the largest can and nothing suitable in between. I banded her with our largest usual Red-tailed Hawk band, but for safety reasons I didn’t dare weigh her because that would require dropping her legs back into the can. She was a loose fit, and I was afraid once she had room to wiggle, we wouldn’t get her out again without risking serious injury to us (not to her). So after banding, I just pulled her out for the rest of the processing. Although the skies were absolutely full of birds, we only caught one other adult Red-tailed Hawk before our lovely brisk southwest winds turned into gale force. Not only was it blowing everything around inside the blind, but the smaller birds were being shot off along the lakeshore like they’d been fired out of a cannon! Small accipiters like Sharp-shinned Hawks and Cooper’s Hawks already tend to “pop up” quickly from the trees, giving us little time to respond, but these birds were caught by the wind so quickly that by the time we could react, they were already carried off by the winds beyond their ability to turn around to see what was going on. The winds quickly grew so fierce the few Red-tailed Hawks that were braving the winds seemed reluctant to try to move against them, and soon there were nothing but Turkey Vultures braving the storm from our view. While we always wish for southwest winds, and stronger ones at that (10-15 miles per hour is about ideal), gusts of 40 mph and up are not conducive to trapping!